Get a sleep fit for a SUPERMOM at Sleep Country Canada. You can celebrate Mother’s Day with a great offer right now. Get $20 off for every $100 you spend at Sleep Country Canada stores. 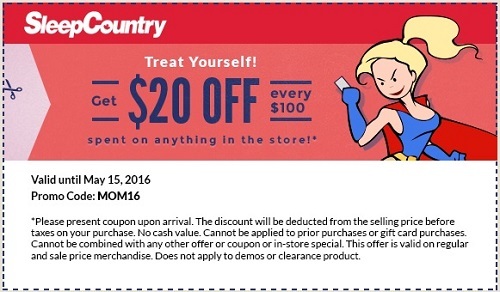 If you want to access this offer you must print a special coupon, bring it to your nearest Canadian Sleep Country store and redeem it. The offer is on until Sunday, May 15, 2016. Official source of the information is Sleep Country Canada. For more information about the promotion visit your nearest Canadian store location or Sleep Country Canada online.